Jim Darcy told the Seanad that the words ‘Sinne Fianna Fáil’ were “appropriated” and should be changed back. 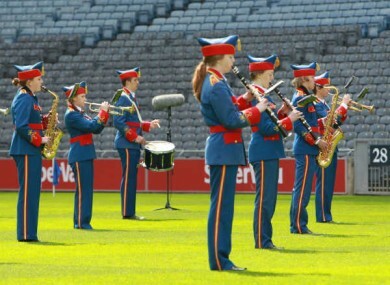 Crowds at Croke Park would be singing an alternative version of the National Anthem if Fine Gael senator Jim D'Arcy had his way. A FINE GAEL member of the Seanad has called on the government to change the wording of the national anthem – replacing the words ‘Fianna Fáil’ in its opening line. Jim D’Arcy told the Seanad this morning that the words ‘Sinne Fianna Fáil’ had been “appropriated” by the country’s first governments and that, with the copyright shortly expiring on the anthem, it was an opportune time to restore the original wording. Could I ask the Leader, perhaps, that he might suggest that the lines that were appropriated from ‘laochra fáil’ to ‘fianna fáil’ be changed back to their original wording. Burke deemed D’Arcy’s contribution out of order, as it was not related to the order of business being discussed at the time. D’Arcy’s comments followed discussions on the attacks in Norway and its impact on a culture of party extremism. The translation of the opening line of Amhrán na bhFiann – which was originally written in English, as ‘A Soldier’s Song’ – has long been a point of contention. The indirect translation of ‘Soldiers are we’ to ‘Sinne Fianna Fáil’ predates the existence of the political party of the same name, but many have considered the overlap as a deliberate attempt to give one party precedence over another. The State acquired the copyright of the anthem before any ‘official’ Irish translation had been adopted, and no set of Irish language lyrics has ever been formally commissioned by the government. It has been previously noted that when the State acquired the copyright for the anthem it did not pay royalties to its Irish translator Liam Ó Rinn, as it did to its English-language composers Peadar Kearney and Patrick Heeney. Changing the words ‘fianna fáil’ to ‘laochra fáil’ would probably require the anthem to be renamed too; the words ‘Amhrán na bhFiann’ could be substituted by ‘Amhrán na Laoch’. In other Seanad business this morning, Sinn Féin’s Trevor Ó Clochartaigh meanwhile urged the government to prioritise the translation of older legislation which has yet to be published in the Irish language. His comments came after two Mayo publicans last week escaped prosecution for after-hours trading because the Intoxicating Liquors Acts had not been published in the Irish language. Do you back proposals to change the first line of the national anthem? Email “FG senator wants to change words of National Anthem”. Feedback on “FG senator wants to change words of National Anthem”.